When Eleanor was about eight and her sister Gene was ten, the two girls borrowed the Model T of the handyman, Ray North (who helped during the harvest [in Dighton, Kansas]). One day Ray tossed his keys on the table as he went out to the fields to work in the morning and said “You can drive the car if you need to,” probably to Estelene, who was eighteen. But Gene and Eleanor heard him say that and took his car for a spin, with Eleanor working the steering wheel and Gene working the foot pedals. “We just didn’t drive over on the road, where they could see us,” said Eleanor. “We went across the alfalfa field, and then we went up and down the hill a few times. There was a creek that would flood the pasture in the bottomland when we had a lot of rain. We drove across the creek and never got stuck. Going across the creek was the only way to get over there. "Glenn found the lot and decided that it was big enough to build a house on," recalled Eleanor. "Most lots were 40-foot lots; that lot was 175 feet long. He decided that was the one we needed, so he said, ‘Here’s the money. Get it.’ We didn’t even have enough to buy a sack of nails, but by the time we got it built it cost us $2,200. The property was $2,500. And then I’d have to go shopping to find nails because not everybody had them and some places had them but you could only get half a pound or something. Then they told us we had to build a garage and I had to go down to court to get a release for that because we didn’t have enough money to build a garage. We had a foundation for it and that was it. We had a metal shower in the bathroom—no bathtub. Harold McNees, who was also building a home, hired more help than we did. We didn’t have any money.” The house was finished in time for Pat's new little brother, Steve, to have a home. It was the first real home Glenn and Eleanor had -- until 1947, they'd moved with his jobs as an ironworker. 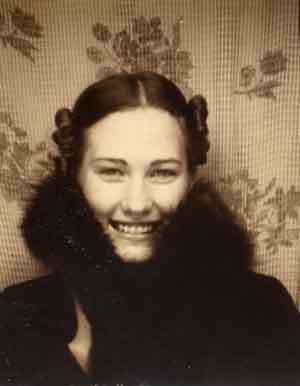 When Pat was a teenager, Eleanor decided it was time to go to college, so she could get a good job. 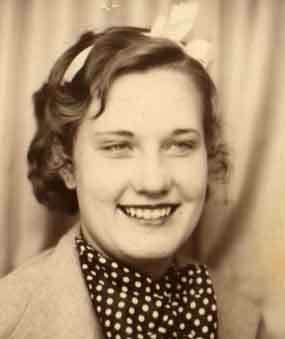 She took enough courses to get a job at the Bank of America, where she and Norma Hancock developed a system: If a bank robber entered the bank where they both worked, at 110th and Main in Los Angeles, they worked out a way where both give the signal that the bank was being robbed -- and they would both collect $25. After a series of falls, which made her afraid of falling, Eleanor packed up a few things and went to stay with Steve and Sue in Salt Lake City, a stay that lasted three years. Sitting in the living room, watching CNN, she crocheted a few hundred stylish hats, gathering thank you notes and reading and re-reading them (her prize: a photo and a handwritten thank-you note from her favorite writer, Mary Higgins Clark, after her children mailed the novelist a hat and some potholders). A smoker most of her life, she spent her last year hooked up to an oxygen tank by a fifty-foot line that she cursed daily, as she made her way up and down their hallway. Full of “piss and vinegar” till the end, she took great pleasure in announcing one day, as Steve returned home from work, that Martha Stewart had been convicted. She hated the woman for being snooty and for using cheap labor in China to make her towels, which were crummy and hardly fit to crochet an end-piece for. After several months of winning the friendship of the wonderful Hearts for Hospice workers who came to help Steve and Sue with her care, and with one final visit from her nephew Dennis just before she began fading away, she died quietly and peacefully on April 5, 2004, with Steve and Sue and Pat holding her hands and telling her goodbye. She was smart, thin, and good-looking. She was a hard worker, a fierce and dedicated housekeeper (you could eat from her floors), a fighter, a troublemaker, and queen of the nags. She had a great sense of humor, a gift for making and hanging on to friends and for identifying and harassing enemies, and a wonderful sense of hospitality. You always had a place to sleep at Eleanor’s and if you needed something to wear she would make it for you. She hated cooking, but she baked good custard and banana cream pies and, until she rightfully put us all on a diet, made great homemade ice cream. She was a good and loyal friend, sister, daughter, mother, aunt, grandmother, and great-grandmother.